“A little bird told me” is a phrase we were all used to hearing when we were young. Our parents would say it whenever we had tried our hardest to hide something from them, and particularly something to do with school. We never imagined that one day we would grow up to discover that the little bird was real and not imaginary at all. With all the people being detained and forcibly ‘disappeared’, I came across many little birds carrying news to the families who were desperate to hear even a single word in order to ease the pain in their hearts. Hind Majalli was one of these little birds. Oula A. Haidar is a Syrian artist. 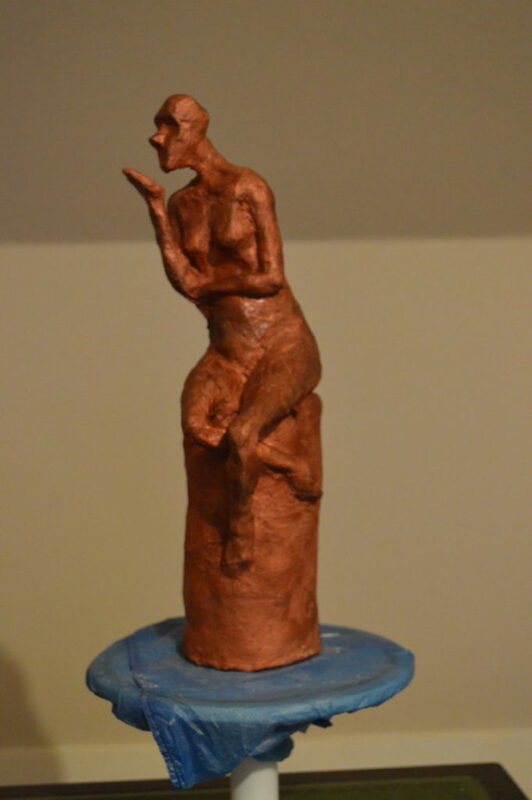 She met the women of the Female Storytellers project in a conference in Beirut in 2015, and she personally realized all the sculptures of this series. [This article is the outcome of a partnership between SyriaUntold and the Syrian Female Journalists Network (SFJN) and part of the latter's project Female Storytellers: Out of the Shadow]. Would she find the telephone number? Of course she would, it had been embroidered onto her clothes some months ago. She picked up the receiver and dialled the number. After waiting a few moments, she heard a weary voice. The man was not reassured, however, and seemed even more dubious and suspicious. She carried on talking, and began to tell him what she had heard about Bilal during the interrogation. It was only then that the man relaxed and identified himself as Bilal’s father. He started to ask about how his son was doing, and also told her that they hadn’t heard anything about him since he left the house around four months ago. “A little bird told me” is a phrase we were all used to hearing when we were young. Our parents would say it whenever we had tried our hardest to hide something from them, and particularly something to do with school. We never imagined that one day we would grow up to discover that the little bird was real and not imaginary at all. With all the people being detained and forcibly ‘disappeared’, I came across many little birds carrying news to the families who were desperate to hear even a single word in order to ease the pain in their hearts. Hind was one of these little birds. But what had she been before? Hind was an English teacher in her forties. She had taught in secondary schools in the city of Daraa for 25 years. On 18th March 2011, she went out to demonstrate peacefully alongside the people of Daraa, demanding freedom, change, the release of detainees, and the repeal of emergency law. She was the first woman in Daraa to be involved in the protests from the very first day. Their voices filled the air, and their demands increased; when their demonstrations were met by gunfire, they began to demand the overthrow of the regime. He looked at her in surprise, and then told her to go out to the car with the security agents. They took her to the infamous Palestine Branch of the security forces in Damascus. One of the soldiers there greeted her with the words, “Ha, are you a jihadist or something?” but one of the men who had driven her from Daraa looked at him angrily, before stepping towards her protectively and saying: “Don’t worry my girl.” Why, she wondered, was she being called such things before she had even been interrogated? Was it just because she had gone out into the streets to call for freedom? Had they really thought that they were going to arrest a Salafi jihadist? Who had planted those ideas in their heads? She spent 14 days in solitary confinement, in a cell not more than a metre squared. It had a hole in the floor for going to the toilet next to a water tap, and the rest of the space was for her. Hind wasn’t subjected to physical or verbal torture, but she suffered from something worse and even tougher to bear: her fear for her friends and family, as well as hearing the voices of other detainees as they screamed during sessions of torture. Her soul was bound in something far heavier than chains. Afterwards, she was released and allowed to return to Daraa, which was now almost unrecognisable. A large number of checkpoints now encompassed the city, and a suffocating curfew had brought life to a complete standstill. The psychological trauma of being detained, however, did not keep her from returning to her earlier activism. The situation facing the city and its population had gone from bad to worse. Hind called for two women-only sit-ins in front of the governor’s residence, aiming to put an end to the curfew in the Daraa al-Balad district. Around 30 or 35 women joined her. On the first day nobody paid them any attention, but on the second day, some security men decided to walk among the women during the sit-in. Their only aim was to frighten them; they did nothing to harm them. The women, however, recall that demonstration as an achievement because the curfew was reportedly lifted a few days later. Women’s demonstrations in Daraa were taking place more frequently, and Hind always participated. As a result, she was summoned to the security branch for interrogation. The officer there caught her off guard by saying: “You know that you’ve brought the women in the whole Hauran region out into the streets?” But Hind didn’t care who had encouraged women to add their shouts to those of the men. She was just happy they had actually taken part. She continued her activism, working between Daraa and Damascus. It was in Damascus that she took on the cases of the first male and female detainees arrested in Daraa with the help of lawyers. She looked into their papers and the details of their cases in the Palace of Justice, the military courts, and Adra Prison. She also met them upon their release from prison, and followed up with doctors on their psychological and physical heath. She was most involved with detainees, but also provided aid to displaced people fleeing from other regions in the country. Anxiety dominated her life, however, for she feared she would be detained again. She began to limit the time she spent at home, as it had already been raided four times. Later, on September 12, 2012, she was forced to hand herself over at the Palestine Branch after they detained her daughter as a hostage. They released her daughter as soon as she arrived. This time, Hind spent four months in a communal cell so small and so full of detainees that it seemed more like a mass grave. Just as before, she wasn’t physically or verbally tortured, but suffered from psychological torture, especially after they threatened to detain her daughter. She couldn’t imagine seeing her daughter in such a place, listening to the screams of people being tortured, and the sound of heads banging against the walls. These noises kept her awake at night the first time she was detained. She found it extremely distressing because she couldn’t do anything about it. Eventually she began to think of a different way she could help, and took to listening in on interrogations through the door of the cell. She would stand with her ear to the door, and ask other women in the jail to keep silent so she could memorise as much information as possible. She managed to memorise telephone numbers, addresses, and sometimes the names of detainees so that she would be able to get in touch with their families if she was released before them. While she was in prison for the final time, she managed to get her hands on a needle and thread. She and the other female detainees in the cell started sewing the names and numbers of detainees onto their own clothes. On the 85th day after her arrest, something seemed to change, marking a new chapter of her life in prison. Strange dreams started to disturb her sleep, waking her up and leaving her trembling with fear and dread. To begin with, she dreamt of her daughter laying a blanket down and sleeping on the floor, just as she did herself. This was followed by another dream where she saw her daughter walking through the passageways of the Palestine Branch. What made her even more uneasy was that she imagined her daughter’s name written on the wall of the prison bathroom. At that point she couldn’t bear it any longer and broke down in tears, screaming: “Where is my daughter? My daughter is here…she’s been detained.” When they heard her voice, the prison guards hurried to her and swore that her daughter was not there. From that time onwards, she took less notice of what was going on behind the cell door, and began to worry about what was happening on the other side of the wall. Behind the wall was another cell containing female detainees. At the time, she didn’t know why, but she would spend long hours trying to hear the voices of the detainees in that cell. She could hear the noises they made, and their voices, but could not make out what they were talking about, or distinguish one voice from another. She spent around 35 days in the same way, until she was summoned by the interrogator on the 120th day of her detention. He informed her that she would be released as part of a prisoner exchange deal with the opposition, in return for Iranians being held by them. He also gave her the devastating news that her daughter was in the neighbouring cell, but that she would not be among the detainees being released as part of the deal. For a whole month, there had been only a wall separating them. Hind later found out that her daughter had been detained on the same day that she started having nightmares about her. The 9th January 2013 was the cold wintery day when she won her freedom as part of the Iranian prisoner exchange deal. It was heart-breaking for Hind. Knowing that her daughter was still in that terrifying place, she was numb to the pain all over her sick, exhausted body, and within the bones that were barely carrying her along. The news of the rest of her family was also bad. Some of them had also been detained, some had been killed, and some had fled the authorities and left the country with their families. Despite everything, she didn’t give in to despair. The long days she spent in prison were just preparation for the next step. She began retrieving the names and numbers, which she had committed to memory and those she had sewn into her clothes. She started to make phone calls to convey the information she had learnt. One of these calls was to the father of Bilal. Bilal was a student from Daraa who had studied at Tartous University. He was arrested on the way to university, and his parents had no idea what had happened. To begin with, Hind had tried to listen carefully to his interrogation, but had not managed to understand a thing. As soon as she heard the word ‘Daraa’, however, she asked the women in her cell to keep silent so she could understand what was going on. This was how she managed to hear his story and memorise his family’s phone number. She rang them as soon as she was released. [Image: Hind Majalli portrayed in a sculpture that was realized by Syrian artist Oula Ash-Shaykh Haidar for the purpose of this story]. She continued her previous activism, including following up the cases of detainees. As she was constantly attending court cases, she was able to gather new information to send to detainees’ families. She would meet detainees as they were released, and would ask them in which branch of the security forces they had been held, and whether they remembered the names of any of the people being held with them. One day, she met a group of young men being released from the Palestine Branch. She immediately asked them about Bilal, and they told her that he had signed his discharge papers and would be released very soon. She quickly phoned his family to tell them the good news, and a few days later she received a phone call from them telling her that he had indeed been released. Her daughter was released two months later. At this time, Hind had started receiving threats that she would be arrested again. Her house was raided, ransacked, and many of her things were stolen. A travel ban was also issued against her, but she did not let that stop her. She carried on working until her younger brother was killed, a week after being arrested. That was the blow that broke her, and made her realise more than ever before that she had become a real danger to her family and friends. Carrying only her handbag, and with her heart burdened by memories and grief, she crossed the border illegally into Lebanon. It was not fear for her own safety that had prompted this decision, but rather the mental fatigue that had overcome her since her younger brother’s death, and her worry for her family and friends who were left. Although she had planned to stay in Lebanon only temporarily to rebuild herself and her life before returning again to Syria, she quickly became involved with groups of Syrian volunteers aiding and supporting refugees in Lebanon. She also remained in contact with civil society organisations in Daraa. Her dream of returning has not been realised because as the situation has become more complex, it is now unsafe for her to return. Her mother died of grief, without a chance to embrace her or even see her again. Recently, Hind has reluctantly moved to Germany, going from one place of exile to another, just as she previously moved to Lebanon. In her heart, she still hopes that she will return one day. [Main photo: Hind Majalli (I Am Human Story/Fair use. All rights reserved to the author)].